As you play through The Division 2's missions, you will hear from this woman frequently. She controls drones, as her name implies. She tells players important information about enemy movements and attacks. She is your even watching eye in the sky. She will also give players missions occasionally. 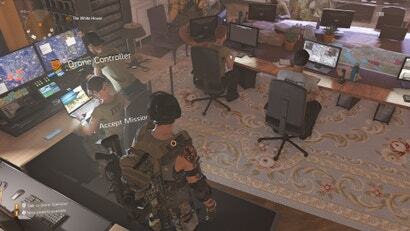 Drone Controller is a valuable member of the team, yet none of us know her name. 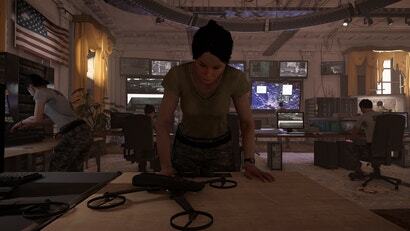 Unlike many other NPCs found in The Division 2, this woman is given no name. She is referred to as simply Drone Controller in missions, in the game’s subtitles and when mentioned in any in-game text. A doctor in The White House, Joshua Summers, who I’ve barely interacted with after finishing his mission has a name. Even random quest givers in settlements around the game also have names, even though they are barely part of your Agent’s journey. If it wasn’t sad enough that Drone Controller has no name, the poor woman also must suffer in another way: Her body is often breaking and freaking out. I’ve experienced this twice when getting missions from her. She began to twitch violently. It was a disturbing moment. Other players have also experienced this and have shared their stories and videos on Reddit and elsewhere. Nobody around her even seems to care. Don’t everyone rush over to help her. Sometimes her shaking gets worse and she actually spins her entire upper torso around. Through all of this body horror, Drone Controller still gets the job done. She won’t let her body completely spinning around and shaking violently stop her from controlling the drone. Though, honestly, if she wanted to take a break during these moments I think most folks would understand. Take care of yourself, Controller. Players have also walked in and found Drone Controller watching them in a way that makes one think she might be possessed. Leave the Drone Controller alone, Pazuzu. So, the next time you visit the White House, take a trip over to Drone Controller. Check in on her. Or go to see her freak out and break in different ways. I won’t judge you. At least, I won’t judge you too much. I get it. Sometimes we all just want to watch a person’s head spin around. I think that’s half the reason The Exorcist was such a huge hit. Ubisoft & Massive Entertainment, I understand The Division 2 has many important things that still need to be added and fixes that need to be implemented. But if one of your developers get a moment, can someone help this suffering woman? Maybe even give her a name? She keeps giving me dialogue when I fast travel. Sometimes it's one of the enemy factions but 90% of time she drops a snippet from a mission before cutting out. Figured it was a just a bug but with all this possession talk I'm getting a little worried.